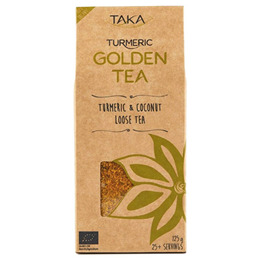 Softly spiced and wonderfully aromatic, TAKA Turmeric Golden Tea is an invigorating, caffeine-free alternative to your usual daytime brew. Rather than relying on caffeine to get you through a busy day, this Ayurvedic tea blends turmeric, coconut, cinnamon and other stimulating spices in a subtle fusion of exotic flavours. Like all TAKA Turmeric drinks and supplements, this loose tea blend has a generous helping of 100% organic turmeric and black pepper. Organic Turmeric 33%, Organic Desiccated Coconut 33%, Organic Ceylon Cinnamon, Organic Ginger 8.5%, Organic Cardamom, Organic Fenugreek, Organic Black Pepper, Organic Cayenne Pepper. To make a warming Golden Tea, add 1 heaped teaspoon of tea blend to every 200ml of boiling water. Stir well, cover, steep for up to 5 minutes and then strain. Alternatively you can use a French press or tea plunger. Enjoy as is or sweeten to taste. TAKA Recommends: Adding a slice of lemon and honey for the most revitalizing Golden Tea experience. Packed in a factory that uses wheat; other nuts; milk & soybeans. Below are reviews of TAKA Turmeric Golden Tea - 125g Powder by bodykind customers. If you have tried this product we'd love to hear what you think so please leave a review.